Now, I love a good costume drama, and Sunday nights are just not the same now that Downton Abbey has exited my life, so I was looking forward to Andrea Arnold’s take on this classic tale. This, however, was not typical of the genre. Instead of decadent sets and tea in the drawing room, Wuthering Heights is far darker, and not just in the subject matter, with several prolonged shots of nothing but darkness. It starts with Heathcliff being brought to Wuthering Heights by Cathy’s father, who fosters him after finding him wandering Liverpool alone. Over what feels like a lifetime, Cathy and Heathcliff build a strange relationship that wavers somewhere between friendship and romance. The sound of the film must have been of great importance to the director, Andrea Arnold, as it seems as though all effort was placed in this area of the film, and certainly not in script development, of which there seems to be none. Although the long pauses were sometimes unnecessary, they were deliberately used to create an eerie atmosphere, accompanied with the sound of wind blowing over the moors. Although clearly intended to create a certain effect, the absence of a score is definitely noticeable in a film this bleak. The long pauses are not just reserved for the script. Shots of insects struggling over the heather or moths sitting walls are regular and, as far as I am aware, pointless, drawing out an already too long film. 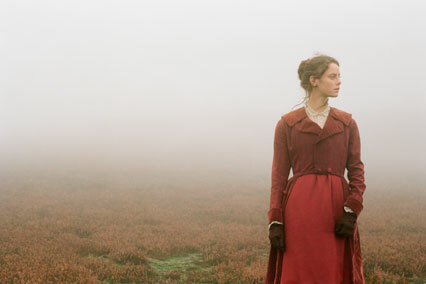 Posted in Arts and tagged film, kaya scodelario, review, wuthering heights. Bookmark the permalink.